AIDS poster, Bombay Hilltop Lions Club (a voluntary community needs and humanitarian organization) and the HIV/AIDS Information and Guidance Centre of Bombay, c. 1996. 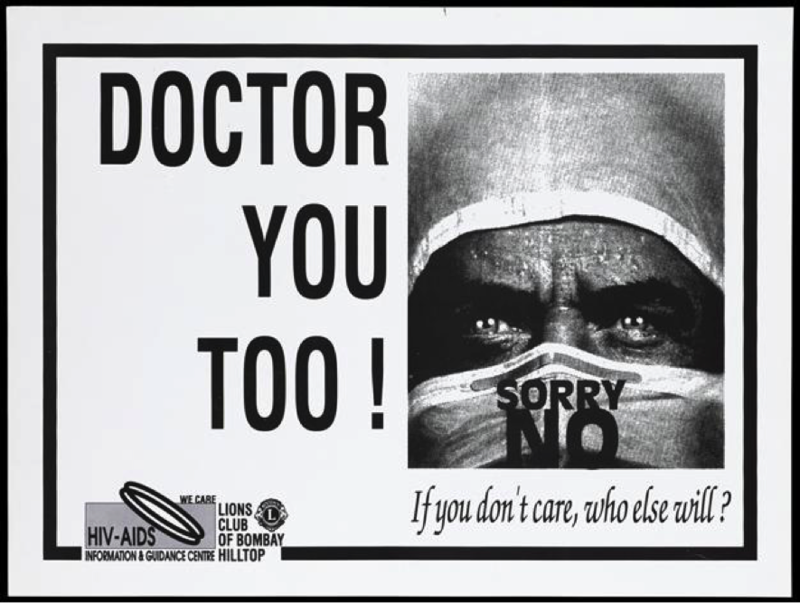 The inset shows a doctor wearing a mask saying “Sorry no”, highlighting the issue of physicians refusing to treat AIDS patients for moral reasons or fear of infection. How do narratives of national AIDS epidemics draw from global discourses of health and development? In my own study of AIDS reportage in Indian medical journals, I argue that in the early years of the disease crisis, doctors initially made sense of the social and cultural dimensions of AIDS as it existed in India locally, through episodes of their individual interactions with HIV positive patients. They also gathered information on AIDS in a variety of cross-cultural settings to translate to an Indian context. However, as the epidemic progressed, the story of AIDS in India became increasingly politicized. Particularly around 1998, doctors began to critically engage with debates concerning the politics of unequal access to standard treatments in developing countries. Thus, by tracing the narrative of AIDS in Indian medical journals, we can see the moment of transition when the ‘global became problematic’. In the early years of the epidemic, doctors focused on episodic local cases relating to a variety of medical ethics issues. Articles focused on problems such as the appropriate attitudes of medical professionals when delivering diagnoses, whether HIV status should be determined in an arranged marriage, and how to obtain consent for collecting blood samples. Typically, the particulars of an AIDS related incident or news story in Delhi, Chennai or Pune is reported, then analyzed for what it illuminates about the medical profession and the delivery of healthcare in India. Because of the nature of transmission and the social stigmas particular to India associated with it, AIDS was treated as a prism, which revealed the shortcomings of medical care. Furthermore, the disease was interpreted through the lens of more widely known AIDS crises in other countries, particularly the United States. Indian doctors were keen to draw lessons from their counterparts in other nations with more experience with the disease and considered their respective AIDS epidemics to be largely comparable, save for certain translatable sociocultural differences. 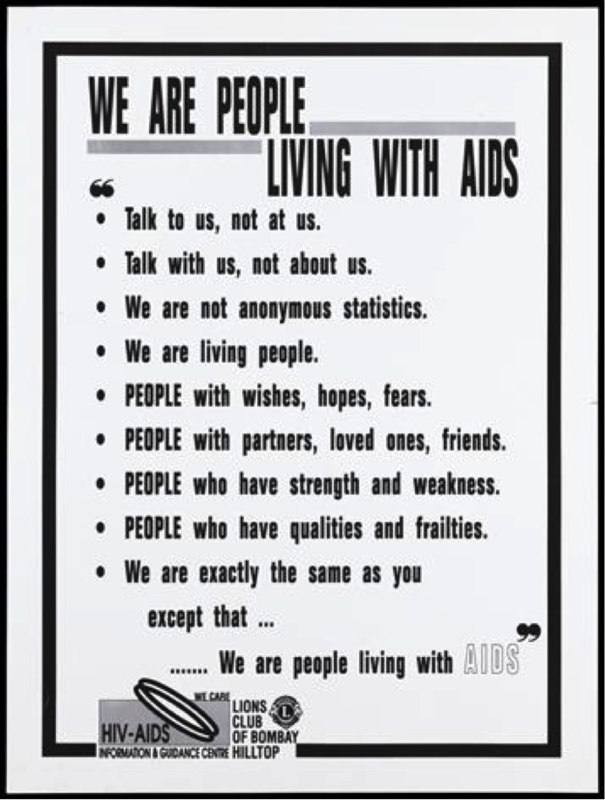 Poster with quotes from AIDS sufferers to combat stigma based on misinformation. Bombay Hilltop Lions Club and the HIV/AIDS Information and Guidance Centre of Bombay. Lithograph, c. 1996. HIV/AIDS Information and Guidance Centre/Lions Club of Bombay Hilltop. Wellcome Library Closed Stores Iconographic. Reference Number: 677263i. Copy Photo Number L 54431. System Number .b16772635. For example, an Indian doctor refers to a study in an American hospital on how physicians were more likely to reveal confidential information with the families of patients who were homosexual, female or black. ‘If we extrapolate these facts to an … Indian setting,’ he states, ‘the discriminatory factors one would expect to observe would be the socio-economic status of the individual and the position of the individual in society.’ Whereas race, gender and sexual orientation would be the social issues brought to light by AIDS for the United States, in India, the parallel social divisions would be class, religion and caste. Thus, at this point in time, when Indian doctors did consult the ethical delivery of medical care in contexts outside of their own, it was considered a simple matter of translation. However, around 1998, as the epidemic progressed and was gaining momentum, the journals shifted their attention from ethically ambiguous case studies of how AIDS patients are treated by the medical profession to broader issues concerning the structural political and economic inequalities resulting in uneven access to health care. Indian doctors began to critically engage with global discussions, particularly after the publication in the New England Journal of Medicine of an article on placebo-controlled clinical trials for Zidovudine, an antiretroviral therapy treatment. Authored by Peter Lurie and Sidney Wolfe, it called for a uniform international standard dictating the conduct of clinical trials in parts of the developing world and generated several heated response pieces. One essay criticized the ethics review boards of nations that would allow big foreign pharmaceutical companies to run experiments on their citizens. At the same time, it sympathized with the need to provide immediate and realistic solutions when people are dying. Another was a critique by Ronald Bayer of Columbia University’s School of Public Health on the debate in the American medical community ignited by Lurie and Wolfe’s piece. Bayer questions the preoccupation with the rigid methodological particulars of the 15 trials discussed in the original article, rather than the actual humane conditions under which clinical trials in low- to middle-income countries ought to take place. Thus, medical journals are discursive spaces where doctors, researchers and other health professionals negotiated ideas about their country’s AIDS epidemic in conversation with debates about the relationship between delivery of health care and development circulating at an international level. More importantly, we can see a progression in how AIDS was framed. From a belief in unproblematic global community and transnational flows of epidemiological and biomedical knowledge, Indian medical professionals came to realize that there is a fundamental infrastructural disparity in how disease is experienced because of geographical difference. For a discussion on how the ‘global turn’ has affected the history of medicine and the history of colonial and postcolonial medicine, see Sarah Hodges, ‘The Global Menace’, Social History of Medicine (2012) 25:3, p. 719. Sunil K. Pandya, ‘The Patient with AIDS’, Indian Journal of Medical Ethics, February – April 1994, p. 3. Aabha Nagral, ‘Privacy in Public Hospitals’, Indian Journal of Medical Ethics, Jan – March 1995, p. 6. Peter Lurie and Sidney Wolfe, ‘Unethical trials of interventions to reduce perinatal transmission of the Human Immuno-deficiency Virus in developing countries’, New England Journal of Medicine, 337 (18 September 1997), pp. 853. For more information on the debate the Lurie and Wolfe article ignited in the American medical community, see: Atul Gawande, ‘Does the Third World Deserve Second Rate Treatment?’, Slate, 8 November 1997. (Accessed 15 February 2015). See other Exeter postgraduate research profiles here.